For a corporate reception at the Fairmont Chicago, a soft summer palette of creams & yellows combined with warm candlelight. Communal tables and white furniture offered seating, while bar service was created with custom, mirror-framed bars. 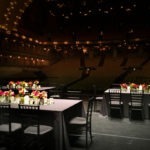 On stage at Chicago’s Auditorium Theater, we teamed up with Blue Plate Chicago to provide vibrant tabletops featuring collections of seasonal floral and candles for illumination. A long mirror “runner” under each tablescape created a little added on-stage drama. 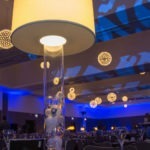 In partnership with Carmel Entertainment, and inspired by 1871’s contemporary business platform’ unique light bulb centerpiece-lamps were created to represent the “bright ideas & innovations” that make up this entrepreneurial hub. 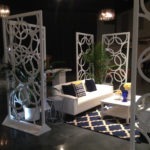 During a design showcase at the Museum of Broadcast Communications, we accented crisp white furniture with bold pops of royal blue and bright yellow. 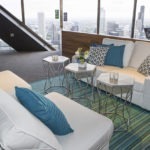 The space was further defined with geometric wall panels for a sleek, contemporary feel. 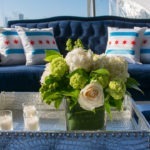 In partnership with Chicago Is…, we enhanced Untitled‘s existing ambiance with custom decor, floral and candlelight in order to create a sophisticated Chicago Speakeasy. 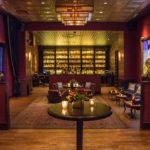 Rolling wood bars, wrought iron furniture and vintage Chicago flag pillows all lent an air of Speakeasy mystery & style. Photos by Eric Craig Photography. 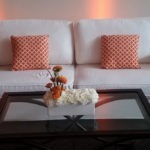 For a corporate reception, we enhanced the look of 19 East with stark white furniture, bold orange floral and splashes of colored lighting. A corporate welcome reception at the Chicago Marriott featured a fresh farm-to-table menu. Our decor played on that theme, including seasonal blossoms, fruits and vegetables. 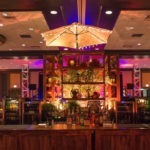 The “rural” feel was continued with rustic lanterns, weathered wood bars, market umbrellas and country accent pieces. Photos by Eric Craig Photography. No one loves a challenge more than we do! With just a few days to prepare, we brought McCormick Place to life for our pharamaceutical client and 2,600 of their closest friends. 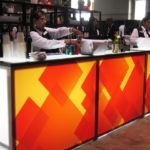 By incorporating our client’s colors into the furniture, floral, bars, entrance and decor, we created an exciting & energetic evening reception!